We publish poetry: at T.S. 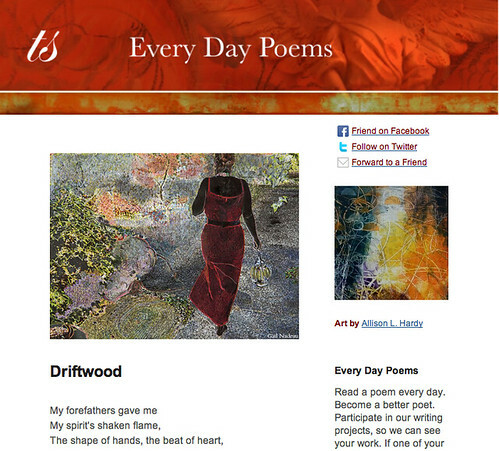 Poetry Press, Every Day Poems, and here at Tweetspeak. Writing short fiction is a marvelous playground for the poet to develop these essential ingredients, so we encourage you to try it, and we make a point to feature it. Today’s short fiction is by Sara Barkat, a fifteen-year-old who writes sestinas, sonnets, and whatever else she can poetically get her hands on. Do you sense the poetry in her fiction? Can you put her fiction into your poetry? Looking back through the innumerable folders stored on my Padd, in an attempt to go through and organize them into some sort of coherency, I found many documents I had forgotten about. One such was connected to a particularly memorable story, an encounter with a most singular individual. I was on a long, tedious flight, and had exhausted all methods of amusement. Most of the passengers were dozing, it being night now according to the planet we’d left, but I was just passing through on a longer journey, and was depressingly alert. I stood up to stretch my legs, wandering over to the back of the craft. To my surprise, someone was standing there already, looking out the small viewscreen. The surprising thing was not that he, like myself, had obviously had nothing to divert him; but that he was a Vulcan, quite young, dressed in a Starfleet uniform—medical or scientific I couldn’t tell—and that he was smiling, quietly, as if at some private amusement. I had met Vulcans before—in general, I found them to be excellent conversationalists, if occasionally coming off as slightly superior. He turned to look at me, as if only just pulled out of his reverie, though he must have heard me minutes before. “The view really is amazing, isn’t it, ” I remarked. “To Earth or the window?” I quipped. “My brother is getting married, and, of course, the whole family had to come—even if we haven’t spoken in years.” I shook my head in annoyance. My companion was looking at me now, thoughtfully. “Perhaps it will be an occasion to patch up relationships, ” he suggested. “That’s likely, ” I muttered. In the depths of space, stars—bigger than can be comprehended with the human mind, small enough to cover with a fingernail—slowly slipped past. “I am familiar with that, ” he said. Photo by kurtxio, Creative Commons, via Flickr. Short fiction by Sara Barkat. Prompt Option 1. Write a short piece of fiction that involves a single event and a dialog between yourself and someone you admire or wish you could meet. Prompt Option 2. Find the poetry in Sara’s fiction and put it in a poem of your own. Try to capture a sense of story, no matter how small. Sara! So happy for a glimpse into your work. Honestly, I don’t know where to start. I could say all the same things as Lyla. So, consider them said. Sara, you have a marvelous way of capturing and sustaining voice in your writing. This one is full of persona. The details you use show such an understanding of characterization and how to create scene and atmosphere. My favorite line: “I had met Vulcans before….” It’s wonderful what you do with that. Sara, I like that early in the story, you say that Vulcans are excellent conversationalists, and then you prove it by giving us an excellent conversation. I want more! Gimme, gimme, gimme!